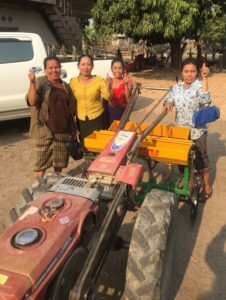 Leigh Vial, of ‘Seeders for Lao Farmers’, recently reported on the rollout of mechanical seeders to selected farmers in Savannakhet, the Lao PDR. Now that Leigh has returned from his visit, he reports below on the success of the program. We can report the successful roll-out of our ten drill seeders in Savannakhet. During the week of 13-17th March, we visited nine of the ten chosen villages, demonstrated the seeder and attracted immediate enthusiasm at all locations. I was relieved to see the seeders performed as expected, if not a bit better. As anybody who has bought anything on-line before, it doesn’t matter how many pictures and specifications you look at, it helps to see it work in the flesh. I had expected some rapid adjustments to the seeders during the week, but we made none. We are also pleased to report that we achieved an immediate sale in nine of the ten villages. 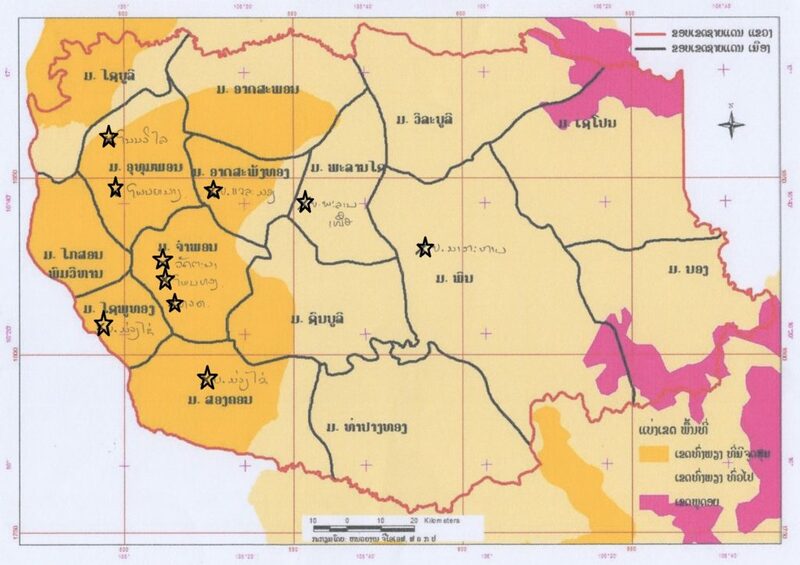 See the location of villages below—we covered the parts of Savannakhet that are taking up drill-seeding quickly. We indulged in some theatre at each location, deliberately seeding a roadway to demonstrate the no-till ability, and seeding maize and peanuts, which they had not seen done before. We seem to have threaded the needle between a machine heavy enough to penetrate hard soil when required, but light enough to be maneuverable. What encouraged me most was the depth of thought that some of the leading farmers had put into drill-seeding techniques and weed control in particular. Weed control will be the defining issue in the change from transplanting to seeding. They have been quick to observe the change in weed dynamics, and have some good ideas about how to counter it. Observation of spatial variation in weeds is central. So now we watch and wait as the wet season approaches. Staff of the Provincial Agriculture and Forestry Office, Laos are ready to visit the new owners twice during the season, to document their experiences. We will also convene a farmer experience sharing workshop in Savannakhet later in the year. These farmers will be the centre of the workshop—a novelty in a system that generally has just told farmers what to do for many decades. As a final postscript, I have always been aware that good direct-seeding systems should free women and girls from weeks and months of drudgery in transplanting every year. It set me back a little, however, to see the extent of the female enthusiasm for the seeders when they were demonstrated. These seeders are not the be-all and end-all of female emancipation in rural Lao, but what they represent is a huge step in that direction. Thank you for your generosity and faith to get us to this point. We seem to have placed the right machines in the right context at the right time and I am now confident it will be progress for the households involved. You can read more about the rice seeder rollout on ABC’s Rural news online: Rice seeders may start technological revolution in Laos agriculture as workforce moves out of farming.